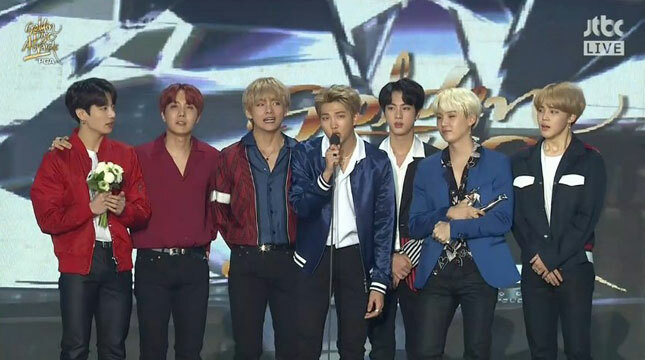 INDUSTRY.co.id - South Korea - Boyband from South Korea, BTS or Bangtan Boys has achieved success throughout the year 2017. Ranging from some of their award-winning awards both in South Korea and international awards, the album's highest-selling sales, Billboard's best-selling song and more. In 2018, members of Bangtan Boys expressed their hopes and plans. Suga said that he wanted to learn a foreign language, especially English and Japanese. While V said, "I want to be able to sing well, I want to focus all my strength and ability on that". Then, J-Hope reveals wanting to keep her health, "We have a lot of plans this year, and if we want to get it done, of course health should be the most prioritized thing." J-Hope also gave a hint about his solo mixtape. "The mixtape I've been working on since last year will be released soon. So I've been trying to make good music. I hope people will listen and love it, "he explained. Jungkook's turn, "Because there are so many things I want to do, I never do it right. But I think this year, I want to do something that can help my career as a singer. " "That's why lately I rarely play games. I want to learn classical music on the piano, and I want to be able to speak a foreign language and sing well. So I plan to work hard on these three things. " Meanwhile, Jimin revealed, "Last year Jungkook started playing drums, and I also learned to play the guitar at the same time. But when Jungkook stopped learning drums, I also stopped learning guitar. Now that Jungkook wants to learn to play the piano, I also want to restart my guitar lessons. If I can, I want to form Bangtan Boys band. " Last RM just said, "For now, is our album," he said giving instructions about the Bangtan Boys new album to be released in 2018.